This is a quick FAQ for the messenger-l list. How do I join the messenger-l list? How do I leave the messenger-l list? Is there an archive of this list somewhere? How do I stop my posts being archived? Help! I upgraded to Messenger Pro 3: why isn’t my new mail being debatched? Why isn’t ctrl-clicking Message IDs working with Google Groups? How do I play a different sound for new mail? How can I filter on something with * in it? What version of POPstar am I running? How can I get hierarchical groups? How do I search a number of groups in the same part of the tree? How do I print from Messenger Pro? Why isn’t my wastebasket being emptied automatically? How do I clear the For attention flag? Are there any other icons for Messenger Pro 3? For recent versions of Messenger Pro, use Utilities->Mailing list->Subscribe messenger-l from the iconbar menu or Misc->Utilities->Mailing list->Subscribe messenger-l from a window menu. In striking symmetry to the above, use Utilities->Mailing list->Unsubscribe messenger-l from the iconbar menu or Misc->Utilities->Mailing list->Unsubscribe messenger-l from a window menu. Alternatively, since every message shows the unsubscribe address at the bottom you can just click this in Messenger and a new message to the appropriate address will be started. Send it and you’re done—no need to worry about a subject or text. The address is also listed in the List-Unsubscribe header (ctrl-h or backspace to show full headers). If you have messenger-l set up as a mailing list, you may find that the confirm unsubscribe... message appears in the mailing list folder. You need to make sure you Adjust -click on the reply button in Messenger Pro 3 (the contextual help says Reply to sender ) and for earlier versions, you need to Select -click on the envelope/mail button (the contextual help says Reply ). Otherwise, you'll probably send the confirmation back to the main list address and you will not be unsubscribed. The answer used to be no but Mark Sawle created a messenger-l archive as of 2006-04-06. Do remember that even if your original posts are not archived, follow-ups may well be. You may also wish to spare a thought for anyone else in the future who may benefit from the information either in your post or generated by it. If you are using Messenger Pro, you can go to the Message editing choices and choose Archive disabling... where you can then type in the name you have given the Messenger Pro mailing list. Messenger Pro will then add X-No-Archive: yes to your posts to the list. which should add it to every mail message. which will add it to all your usenet posts. If you were using SpamStamp (up to version 1.01)or BogoFilter, you need to edit the transport’s Params file to tell Messenger Pro to look in the checked directory. Change text to checked and all should be well. You will have done this when you first installed SpamStamp (pre-1.02) or BogoFilter. Refer to their StrongHelp manual for details. Google Groups changed the format of their Message-ID lookup. Messenger Pro up to 3.03b4 have an incorrect link. Since Messenger Pro 4, ctrl-clicking has been disabled as ctrl is used to disable the URL clicking mechanism so that you can safely select parts of e-mail addresses, URLs etc. without immediately launching them in your browser or trying to e-mail them. You now have to Adjust-click over the Message-ID and choose Fetch news message of this ID using your Browser . You can place Armadeus format samples in !NewsDir.UserHome.youruser.Messenger.samples and choose different samples for mail from different addresses in your Address Book. Filtering occurs on your message server so I shall only talk about MsgServe and I recommend you read through the Message Filtering and Defining a Message Filter pages. I shall elaborate and explain from that basis. If the RegEx module is not RMLoaded and you use a filter with =˜ or !˜ , MPro will complain that You have used regular expressions in your filters but the RegEx module isn't loaded - all such matches will fail . See also A Tao of Regular Expressions. If you have typed the header name in the left-hand side of the criterion, ensure it does not have a colon on the end: e.g. Spam is correct but Spam: is not. Under normal filtering, the * acts as a wildcard. In order to search for the * character itself, you will need to use Regular Expression filtering. See above for where to get the RegEx module. This will be contained at the end of your User-Agent header, e.g. 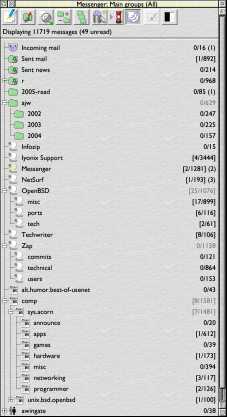 User-Agent: Messenger-Pro/3.03b4 (MsgServe/2.16) (RISC-OS/5.08) POPstar/2.06-ds.2. Any message you have sent to a mailing list will tell you which version you are running. Use Ctrl-h or <backspace> to show the headers. Darren Salt maintains the most recent releases. If you upgrade and have been using SpamStamp (pre-1.02) or BogoFilter, it may be a good idea to reread their installation notes first. You may need to repeat some steps you took when you first installed them. The tree view or hierarchical groups was introduced in Messenger Pro 3.10. The tree view (on by default) offers a way of tidying/reformatting the groups viewer by using . as a separator. As you can see from the screenshots, the groups are still grouped first by user and then by type (inbox, personal folder, public folder, mailing list, newsgroup) and then the hierarchical naming is used to build up a tree view. The tree is also used for the menus for copying and moving messages. It is controlled by Use tree view in group viewers in the Advanced Options and is on by default. 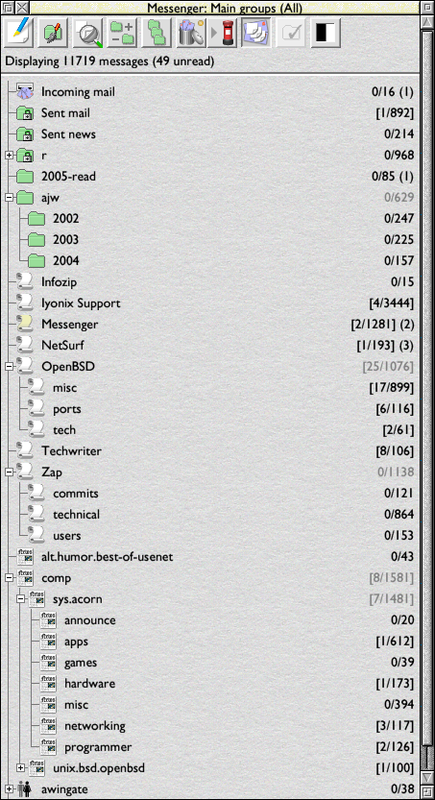 Before Messenger Pro 4, you had to manually type comp.sys.acorn. *, for example, which would search everything under comp.sys.acorn. but from version 4, you can select the parent node, comp.sys.acorn , using the menu in the Search dialogue box. You may also select that part of the tree in the groups viewer and then click the Search icon. From version 5, you can select multiple groups before clicking the icon and search them all. If you are an administrator, you can search SomeUser/* to look through all of SomeUser’s personal folders or * to search all possible folders. Messenger Pro 5 allowed you to search just your own personal folders by using /*. For these examples, the asterisk * makes it more obvious that all the groups are to be searched but is not strictly necessary as it is otherwise implicit. As such, an empty field would also searches all folders, SomeUser/ searches just SomeUser’s folders and / just your own personal folders. 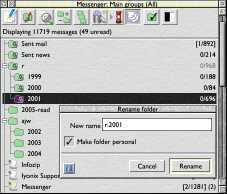 Before version 5, Messenger Pro itself only supported text printing. If your printer accepts text printing, check that Print linefeeds is ticked in the Text printing options of the Configuration section of your Printer driver. If your printer does not support text mode printing, Peter Gaunt’s PEM (for Print EMail) may help but it is not Iyonix-compatible. Or you can use Writer, Writer+ or any other wordprocessor or DTP program to create the document to print. You may want to save the message as Short headers , which has been the default in recent versions of Messenger Pro. Messenger Pro 5 prints only as graphics instead although the above techniques may offer more control over the output. Why isn’t my watebasket being emptied automatically? 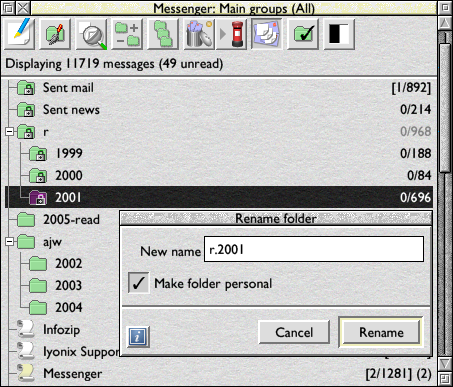 The first thing to check is whether Enable automatic expiry of old messages is ticked. This may be found in Group management , accessed via Choices. Look in !NewsDir.MsgServe and open the Groups file into your favourite text editor. Search this file for <yourusername>.wastebasket. At the end of that line, there will be a G followed by a number, for example, G263 . The wastebasket for <yourusername> will be in the !NewsDir.MsgServe.Spool.0.G DIV 77.G MOD 77 directory. For 263, 77 goes into 263 three times leaving a remainder of 32, so the directory will be !NewsDir.MsgServe.Spool.0.3.32 . The BASIC program, FindBasket, automates this. It will ask you for the number, calculate the directory name and open it in a filer window. Download FindBasket 362 bytes). Delete all the numbered files in this directory. You must keep the Group file though. You now need to repair the wastebasket. Select Group management in Choices, and use the scroll bar to take you to the bottom of the list of groups. Select yourusername/wastebasket and click Repair . You should be told that the group has been repaired successfully . For attention hijacks the otherwise unused unread and replied-to state which explains the slightly awkward way to unset it if you do not use it as a reminder to reply to the indicated message. There used to be a few examples on Nick Boalch’s site when he hosted a Messenger FAQ. I worked from some of those and merged the button design in with those supplied with version 3. My efforts may be found in the overlay file in my MPro3-icons.zip 5655 bytes). If you open up !Messenger.Resources.UK.Sprites22 into Paint, you can drag the overlay file into this window and save Sprites22, your icons will be ready. Do take a backup first. If you really like the old version 2 icons, you can drag the Sprites22 from there into the Paint window instead and save. I liked a combination of the two, and you can see my iconset in the screenshots on this page. RegEx module (based on GNU RegEx 0.12). NewsHound. Replacement 32-bit !RunImage for Newshound. Hermes—part of R-Comp’s NetFetch 2 or Dialup 3. Original version by Dave Higton.